Do you enjoy a good wine and having a great time with your friends? If you answered “yes,” then we have something special for you. It’s never been easier to visit Valle de Guadalupe witht uberVALLE. It allows you to get a safe and reliable ride to Valle de Guadalupe, explore the vineyards, and get home all without the hassle of having to do any of the driving yourself. uberVALLE offers a day-long, round-trip rides to Valle de Guadalupe. Your driver will wait for you as long for as you need so you can enjoy the vineyards. Once you’re done for the day, your driver will get you back home safely to wherever you’re staying in Tijuana or Ensenada. 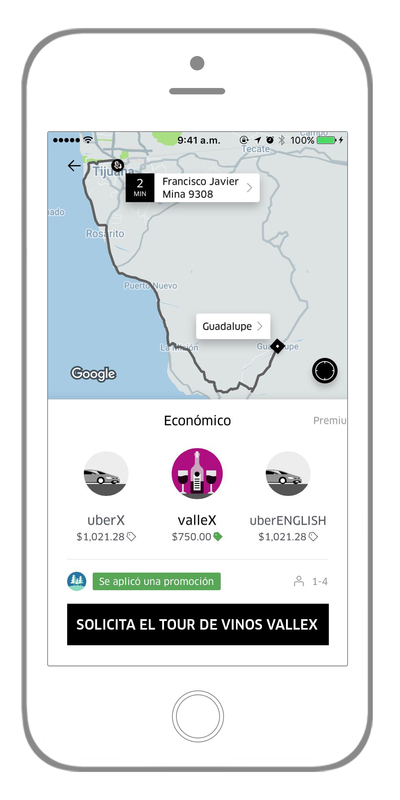 You can request uberVALLE from Tijuana or Ensenada by selecting “valleX” in the Uber app. Remember, like uberX, valleX can carry up to 4 passengers, while valleXL can fit up to 6 passengers. And like always, you can split the fare with up to 3 passengers in-app to cut down on costs. Request ‘valleX’ or ‘valleXL’ within the Uber app.. Enjoy one or multiple stops in Valle de Guadalupe. There is no minimum or maximum wait time. Your driver will wait for you until you’re ready to head home. Whenever you’re ready to go back, call or text your driver within the app. Your driver will be waiting for you where you were last dropped off. The driver will end your trip at your last destination. When and where is uberVALLE available? You can request valleX and valleXL 24/7, from Tijuana or Ensenada, until September 30. There is no time or distance limit, just a minimum fare (see more on that below). On average, a round-trip (with no wait time) to Valle de Guadalupe will be ~$807 MXN in valleX and $1,124 MXN with valleXL. For every additional hour of wait-time once you’re at Valle de Guadalupe, there will be an additional $200 MXN added for valleX trips and $300 MXN for valleXL trips. The total fare will depend on the time and distance of your trip. For example, if your driver waits for 5 hours at Valle de Guadalupe, you will pay around $1,000 MXN for the wait time and $807 MXN as the base fare for a total of $1,807 MXN. Don’t forget, you can split the fare with friends, and spend a worry-free evening in Valle de Guadalupe! In average, the fee will be of $500 MXN per round trip with valleX, and $700 MXN with valleX. From that fee, there will be an additional quantity added, considering every extra wait hour ($200 MXN in valleX and $300 MXN in valleXL). The total fee will depend on the time and distance of your trip. For example, if your drivers waits for you around 5 hours, you will pay around $1,108 MXN to spend the entire afternoon in Valle de Guadalupe.